Affiliate Marketing For Bloggers -Turn your blog to a machine! Affiliate Marketing For Bloggers -Turn your blog to a machine! Affiliate Marketing For Bloggers! The course for bloggers who Want To Do Affiliate Marketing & See Results! Exposed! Result-driven Affiliate Marketing methods the few successful bloggers are using! Anyone (including you) can generate income blogging but not everything you are told will work for you. Affiliate Marketing is the best way for bloggers to make money online. If you can’t create a product, you can still monetize. Anyone blogging in any niche can make money with Affiliate Marketing. There is a lot of free materials online that can mislead you. You can make 1000s of dollars every month just by blogging and doing Affiliate Marketing. You’ve struggled with Google Adsense and banner ads and nothing is going. You tried sponsored posts but no advertisers seem to have seen your blog. Your friends tell you they make big figures but you are yet to find out how. You even tried freelancing on Fiverr, Elance, Freelancer, etc but still no hope. Your blog has 100s and 1000s of daily readers, yet no consistent income. You see income reports on other blogs and you keep thinking it only works for them. You are just starting. You are confused what to start with. Don’t worry! I once was there! Who am I and why buy my book? I’m Enstine Muki. I’m just a normal guy who spends time trying things and showing others what works for me. I do Affiliate Marketing on my blog and my results are very exciting. I have created platforms and products to help bloggers get traffic and make money. I’m the creator of EasyRetweet, CashDonator, BlogExpose, BroadedNet, MyCommentAuthors, and more. I have Affiliate Marketing techniques I use on my blog with great results. Anyone else can use these same techniques in any niche with same and even more results. I have carefully studied some other very successful blogs and found out a lot of things they do to generate real income. Trust me, these guys know how to use what works. But they will never tell you their secret and that’s true! In this ebook you are about to buy, I mention names and show you some blog posts on their blogs how they generate income. My book is filled with practical examples you can start implementing on your own blogs, no matter the niche. No risk of saturation! Check out what some real bloggers like you say about me! Enstine is an up and coming top blogger who continually comes out with great content that provides his audience with actionable tips and case studies to help take their blogs to the next level. Keep an eye on Enstine and his continued growth during 2016! 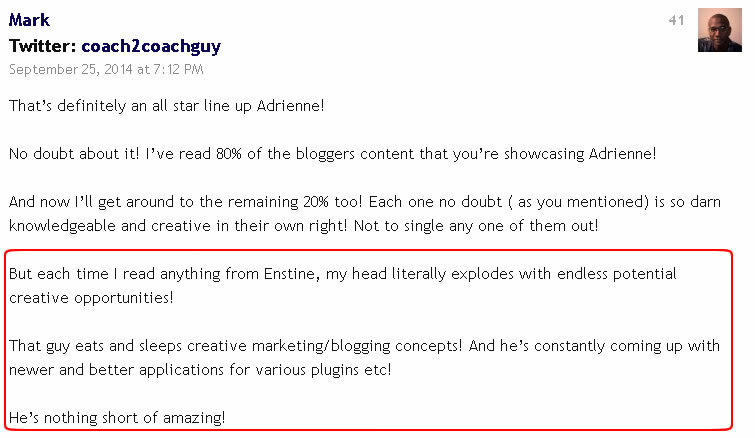 Enstine is one of the more innovative bloggers online. He tackles a wide variety of subjects but always seems to adopt a fresh new perspective on solving common blogging problems. I love his genuine, honest writing style and hustle. He’s a gem! Enstine is one of the smartest bloggers I know. If you are looking to make money with affiliate marketing, this is the eBook you want to read! What is Affiliate Marketing For Bloggers By The Way ? In this ebook are the things top bloggers do in their secret rooms that generate the results you see on their income report page. In this section, I explain in details the 10 things you should consider before joining any affiliate network. This is where most bloggers are going wrong. You need this information if you want to really start seeing results from your blog by promoting the right affiliate products. Bloggers everywhere are doing the same thing with average or NO results. In this section, I show you with practical examples 7 things I do that make my blog stand out in Affiliate Marketing. This is very practical and will start producing results if you implement them on your blog. In this same section, I take you to some blogs and show you how their owners use some of these techniques to generate income. 6 Ways to empower your blog with earning capacity. If you want your blog to make consistent money in Affiliate Marketing even while you are away, you need to jump straight to this section. I explain in details and examples 6 things you need to do on your blog so that it can generate income for you through Affiliate Marketing anytime. There are things you will learn in this section that will shock you. All I ask is you implement them. Understanding the AIDACA Technique and how it helps boost income. You need to be able to create money making blog posts that will make it difficult for readers to leave your blog without clicking the BUY button. What’s AIDACA and how does it help your blog make money? Check this out in the ebook Affiliate Marketing For Bloggers. There are some periods of the year your blog should explode in Affiliate Earnings. In this section, we discuss some of these seasons. I show you practically how these seasons can take your income through the roof. I also discuss with some examples what to do as soon as a season is over. This will shoot your blog up for more results, come next season. Are you building a list for your blog? Most of us have learned to build a list for our blogs but how do we use it effectively to make commissions? Is it by sending affiliate links to our subscribers? What is that secret thing I did that generated 7 sales within 24 hours? Social media and affiliate marketing. Some bloggers get it completely wrong. Belonging to 20 Facebook groups or Google community does not mean anything. In this section, I discuss how to effectively use social media to promote affiliate marketing products. I show you the three different things to share on social media as far as affiliate blogging is concern. The third thing on the list will generate more results. Also in this section, we discuss an exciting free tool to automatically monitor your social media campaigns in Google Anlytics. Use this tool to generate campaign URLs and it will show you which campaign is doing well and which is a pure waste of time. NB: This is the same tool I use to extraordinarily increase my productivity on social media. It help me to identify Facebook Groups and Google Plus Communities that have been wasting my time. There is so much more for bloggers in this book. Whatever your niche is, you can generate earnings with your blog. Everything you need to know is now available including how to add 1000s of banners without looking stupid, Affiliate Marketing and SEO, etc. I want you to get 10x the value back from your investment in this book. If you do not feel Affiliate Marketing For Bloggers and the methods explained can help you, I’ll give you a 100% full money back refund up to 30 days after purchase. I am confident what I shared in this product will work for you. These are methods that work for me and other successful bloggers. The only reason it may not work for you is when you fail to put them to practice. However, I do not promise or imply you can get rich by just reading without hard work and sustained effort. I had the opportunity to get somewhat of an advanced copy of Enstine Muki’s new product, an E-book called Affiliate Marketing for Bloggers eBook (AMB). Since I am and have always been very drawn to affiliate marketing, I was happy that I could be one to give my honest testimonial of his book. There are many, many E-books online about Affiliate Marketing but so few are ever updated with new information. I have been following Enstine for probably a year now and believe me, it is though everything he creates, has had a “good luck spell” put on it but in truth, Enstine is a smart marketer and happy to share his findings with others. It took me about two evenings to go through his E-book because I was “so” eager to read what he wanted to share with us. Now that I have read it all of the way through, I will be going back over it and implementing his suggestions, step by step for my business and using the steps he has already been using and having success with. From the start of what affiliate marketing programs to look for, commissions, applying special deals, working with SEO and keywords, Enstine goes over it all. Thank you, Enstine for your hard work in writing this book and sharing some of your secrets. The majority of bloggers who are earning significant money online earn at least some portion of their income through affiliate sales. In fact I would say it’s 101 when it comes to making money as a blogger. This ebook offers great value for the money; it’s comprehensive and introduces a variety of new techniques and tools, many of which I wasn’t even familiar with myself. Enstine is a professional blogger and the right man to provide this info! Enstine has always gone above and beyond to help anyone eager to learn how to make money online. I was so excited when he said he was creating a product that would help others who were eager to learn how to monetize their blogs through promoting affiliate products. After reading this eBook, which happens to be over 80 pages long, he’s shared everything you would possibly want to know to get started and do well. I personally prefer learning from someone who walks the talk and Enstine is that person. He’s always sharing with us things he’s found, what works and what doesn’t, why they work so well and what we should be looking into in some of his blog posts. He’s an open book but very successful by bringing in a full-time income strictly from what he does online. Q: Apart from this ebook, am I expected to buy other products? A: The only thing you will need is an active blog – that’s a blog that is getting some traffic. There is nothing else that you’ll need to spend money on. Q: Will this work in my niche? A: Yes! Any blogger in any niche can implement these methods and make money. Q: Any risk of saturation? A: No! I explain working methods that generate results. All you need to do is apply them on your blog. There will be no saturation. Q: Do I have Private Label Rights (PLR )licences ? A: No! You are not allowed to resell, re-brand or distribute your copy. You can join the affiliate program and earn 50% on each copy sold through your link.